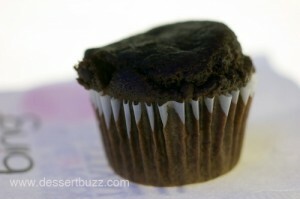 The all-vegan Baby Cakes Bakery had some killer chocolate chip brownies at the New York Food and Wine “Sweet” event. I seriously could have eaten about ten of these things. Not sure anyone would ever be able to tell that these brownies were vegan and gluten free. If you want that moist and super-chocolaty brownie experience but don’t want to consume a half a stick of butter along with it, you owe yourself a trip to Baby Cakes. This item will change the way you view vegan desserts. The Baby Cakes brownie is very similar to the Vegan Divas brownie which I am always raving about–maybe that’s because the baker of the Vegan Divas product Camillo Sabella, used to work at Baby Cakes (he is no longer with Vegan Divas). Here’s a video of Erin McKenna from Baby Cakes talking to DessertBuzz about her brownies. Baby Cakes Bakery is located at 248 Broom Street. Their website is here. Follow DessertBuzz on Twitter.